A bungalow with functional attic, without basement, with built in garage, intended for 4-5-person family. 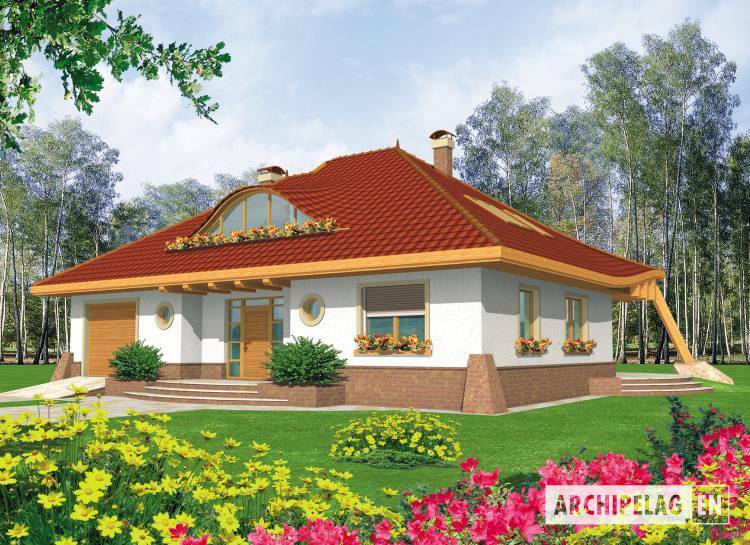 An idea of a house plan was a creation of small "house with a wave". Central entrance was stressed with little moving back and the big eyebrow window on the attic. The impression of the spacious ground floor was get thanks to the big living room combined through a dinette and cuisine and the availability of this zone from two sides. The project provides for the shutdown capability of the kitchen through the big sliding door. In the centre the daily part was planned fireplace. On the ground floor moreover a bedroom was predicted with the bathroom which can also serve as the big study. On the attic directly opposite stairs a space in which it is possible to arrange the library is opening the studio or the recreational appendix. The big bathroom and three bedrooms make the night part of the house up. A house designed in bricks technology with suspended beam and block floor. Internal wooden stairs. A roof of wooden structure tiled with ceramic. The elevation made with structural plaster and stony or plaster siding. Woodwork windows. What does a house plan include?